Spotify functionality keeps improving and now you can share the music you are listening to with your Twitter followers! 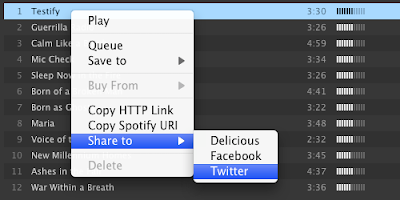 Version 0.3.19 of Spotify now allows users to share what they are listening to with Friends and Followers on both Facebook and Twitter (and Delicious.) Social networking is becoming more integrated to other areas (see Facebook and Twitter integration on the XBox) and Spotify's social integration will drive awareness of Spotify whilst increasing appeal to users.